 The absence of an effective system for communication in abnormal and emergency situations.  The flight instrument system provided insufficient guidance about malfunctions that occurred.  The initial manoeuver that resulted in negative G-loads probably affected the pilots‘ ability to manage the situation in a rational manner. 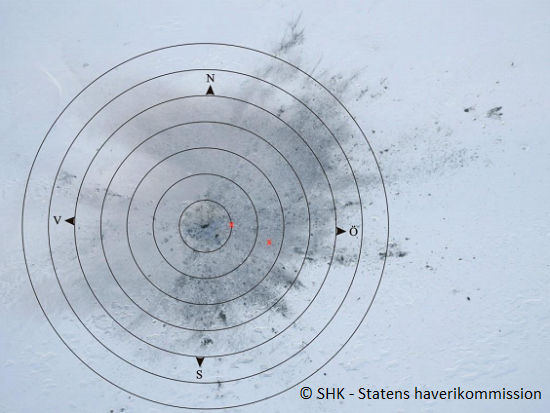 The cargo aircraft disappeared from radar screens whilst flying en-route east of Bodo, Norway. The wreckage was discovered near Akkajaure Lake, Sweden. Both crewmembers did not survive. 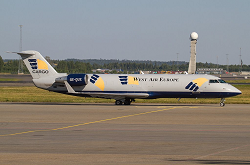 The Canadair CRJ-200 Regional Jet (in cargo configuration) was found to have crashed in northern Sweden with two pilots on board. 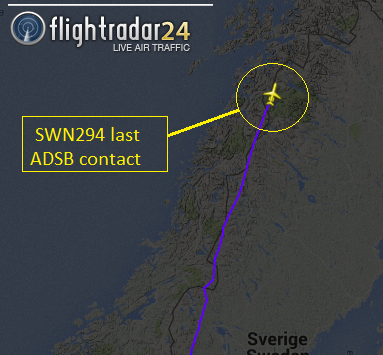 The regular mail flight took off from Oslo Gardermoen Airport at 22:10L climbing steadily to its assigned en-route altitude of 33.000 ft following the NUVSA4A departure route along the norwegian, swedish border. 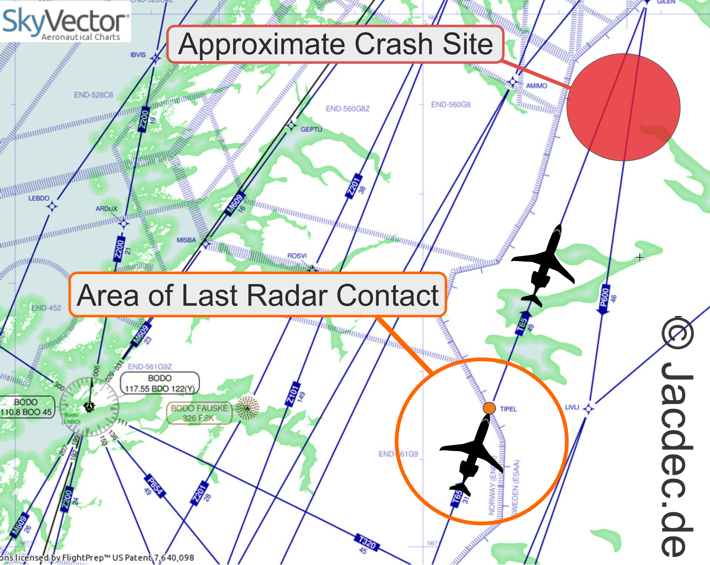 The aircraft followed air routes T311, N150 and T65 to the north when contact was lost in the vicinity of TIPEL waypoint following a brief distress „mayday“ call from the flight at 23:31L, according to the airline. After the flight failed to arrive at its destination, a norwegian F-16 fighter plane was sent out to search for the missing Canadair. 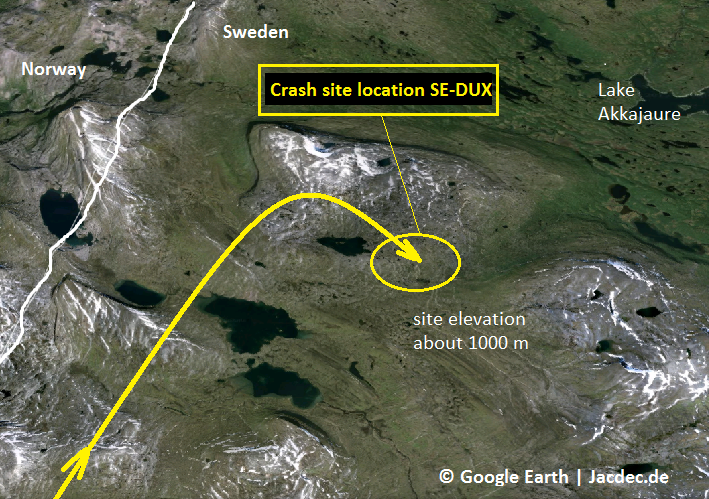 The wreckage was spotted at 03:10L in a remote countryside on the northwestern tip of Lake Akkajaure, Sweden. The crash site is situated on an open snow-covered side of a hill. 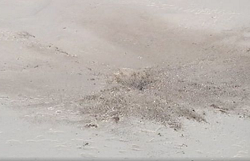 Only one single impact crater was visible. The small dimensions of the crater indicated a rather steep impact angle and a high impact forces. The pilot in command was 34 years old, with 3173 hours flight experience and 2050 hours on the accident type. The first officer got 3050 hours of flight experience with 900 hours on the accident type.